A Sultan RS in GTA IV. The Sultan RS is a highly modified two-door sports coupe variant of the Sultan in Grand Theft Auto IV. The Sultan RS is a high-performance two-door coupe variant of the Sultan, itself based on the Mitsubishi Lancer Evolution V with minor influences (eg, the roof and front end) from the 1998-2004 Lexus IS; although neither real-life vehicle has a two-door coupe configuration, their influence remains obvious in the RS. The customizations of the RS are reminiscent of a stock Second Generation Subaru Impreza WRX STI Rev. A, which is sold with rally specifications. The car could also be emulating a HKS Track Attack Altezza (although there are no evident cues). There are two physical variants: one has a hood scoop, and one does not; there is no apparent difference in performance between the two. According to the rocker covers on the engine, as well as the model marque on the trunk, it has a 3.5 L Twin Turbo powerplant (likely an inline-6 or V6). The car utilizes an AWD drivetrain. It also comes with a carbon fiber hood, roll cage, side exit large-bore exhaust, racing rims, and low-profile tires. Some also have a carbon fiber trunk lid, hood scoop, and metallic paint. This vehicle comes fitted with a high pressure blowoff valve which results in a hissing sound after every gear shift. It also produces a lot of turbo lag because of the high power of the turbo. It is evident that the vehicle is turbocharged, judging by the high-pitched whine produced by the engine at higher RPMs. The exhaust note of this car is similar to that of the Impreza, having an ominous roaring sound. The car is available in several colors, although carbon fiber components (such as the hood and spoiler) are always black. 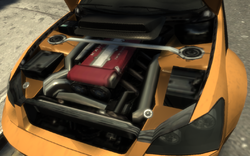 A Sultan RS's engine in GTA IV; its engine block is marked with text reading "Karin Twin Turbo 3.5". The RS' top speed is the seventh-fastest at the lower end of the game's high-performance vehicles at 199 mph (320 km/h). However, its acceleration is the fastest of any car in the game, and its handling is excellent. The Sultan RS is clearly a sports car tuned for asphalt racing, with hard suspension and low profile tires, making it difficult to drive off road, or on wet or uneven roads. It lacks ABS as is customary with many ultra-lightweight track cars. The brakes are powerful, bringing the vehicle from its top speed to a standstill complete stop in very short distances (unlike other sports cars). Another interesting note is that due to it being a lightweight car, it may have the tendency to flip over if sharp turns are executed. The exhaust system of the Sultan RS is prone to letting unburnt fuel explode in flames from the sidepipes during throttle liftoff after high revving, a trait common to only the most powerful cars in the game. The RS is also equipped with a blowoff valve on the turbo which causes a whipping/hissing sound when the throttle is released. Driving the Sultan RS around often results in the rare Sentinel XS STD spawning more frequently. The Sultan RS has GPS navigation, complete with spoken directions, which is unusual in what seems to be a stripped down, lightweight race car. This vehicle can be sold to Stevie, fetching $2500. The Sultan RS in the beta version of GTA IV had a green and blue two tone color, a roots-type supercharger/blower with a bug catcher, and a different spoiler. It can be seen in-game at the mini vendor stands around the city: use the sniper rifle to zoom in on the magazines. This beta Sultan RS can also be seen on the television screens inside the Stretch. In Grand Theft Auto IV, the two default radio stations in the Sultan RS are Electro-Choc and Radio Broker. In The Ballad of Gay Tony, it as a frequently used car to transport/protect drugs in the Drug Wars. Many of these have a unique paintjob which is only available at that time. Frankie Gallo or Phil Bell probably own the Sultan RS, because it's behind their mansion. The Sultan RS does not have the same horn as the regular Sultan. 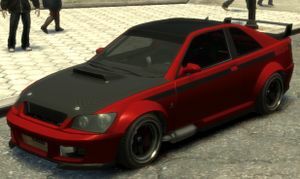 In GTA V, installing a roll cage in a regular Sultan will add the "Sultan RS" logo to the car's rear quarter panels, and it is even possible to make a near-perfect recreation of the Sultan RS as seen in GTA IV by choosing the most expensive parts when modifying a Sultan (with the exception of the wing; the Sultan RS' wing is the High Level Wing, which is second to last on the list of spoilers). However, even with these modifications, the game still considers the vehicle to be a regular Sultan. Parked in the bushes behind the garage of a run-down mansion in Westdyke, Alderney; the mansion is located at the end of a dirt road, at one of the northernmost points of the island. Chances of finding one on the streets increases if the player is already driving one. Sometimes seen competing in Brucie's races, however stealing a competitor's car will end the race and count as a loss to the player. Fortunately, the presence of the RS may cause others to spawn in traffic on the way to the race, during it, or immediately after. Various uniquely colored Sultan RS' frequently appear in Drug War missions involving the Korean Mob; among the unique colorization include those with iridescent purple-blue body colors or a tanish-white roof and black hood. This page was last modified on 17 June 2015, at 04:42.